Without the need to grind after winning an early PPTQ, I’ve been free to brew and experiment. As always, some of these new ideas are good. Most are not. But you never find out unless you indulge your inner Mythbuster and proverbially throw your deck at the wall to see if it works. Never actually throw your deck at the wall. That’s a dumb way to get your cards bent. And store owners are real irritable about dents in their walls. We talk a lot about data and data-driven analysis on Modern Nexus. And why not? Informed decisions are the best decisions. Shooting from the hip and just going with your gut is more likely than not to lead to an 0-2 drop. We like data. The problem is the eternal question of how much data. The most valid results require hundreds, preferably thousands of data points. The problem is gathering them in a timely fashion. This frequently means that you go to press with enough data to say you have a result but you don’t actually have a conclusion. There’s something there in your work, but you don’t quite know what it is or if it really means anything. Why this lament of the academic? Chiefly, I’ve been here before and I’m back again. The deck I played to a Top 4 at an SCG IQ Sunday could be a real Modern contender, but I cannot be certain. Yet. No suspense today, I played UW Spirits. I promised last week that I wouldn’t play Merfolk at another event, but while I was trying to figure out which deck to play I discovered that I’ve spent so much time playing Merfolk that I couldn’t win with anything else. After flailing around with a number of decks, I decided to ease my way out of the rut by playing something similar but not exactly Merfolk. I’d talked about UW Spirits before, so I figured I’d just build the deck and try it out. The deck was interesting. It played a very solid tempo-oriented aggro-control game and was a nightmare for combo decks and Jeskai Control (which were still skimping on sweepers—did they learn nothing?). Spirits are better than Merfolk in those matchups since you played almost entirely at instant speed, Aether Vial or no, and your creatures protected each other from removal. It was worse against aggro decks because your creatures are smaller and your clock is much slower. Jund was also much harder because without cantrips like Silvergill Adept discard was far more impactful. The Tron matchup was surprisingly good. When I first started fiddling with Spirits I thought Tron to be a horrible matchup but this deck trounced it handily. Spell Queller is shockingly good at breaking up their tutoring and Selfless Spirit shuts down their non-Ugin, the Spirit Dragon sweepers. Karn Liberated is pretty bad since you could hexproof your creatures and play empty handed. Tron’s only non-Ugin option was to race with Wurmcoil Engine or World Breaker and Path to Exile shut down that plan. To get some tournament practice I took the deck to FNM where I went 3-2, losing to Abzan and Grixis and beating Living End, UW Control (just), and GR Tron. A middling result, but I gained a lot of insight that I would shortly make use of—but first a digression. I know that the Bant Company version of Spirits gets all the attention. Caleb Durward made a compelling case for the deck a few weeks ago and it has posted results on MTGO. I don’t like the deck because it suffers from The Bant Decks in Modern Problem. What is The Bant Decks in Modern Problem? It’s the difference between their best starts and their average starts. When your typical Bant deck curves a mana dork into ridiculous three-drop into Collected Company for two more ridiculous three-drops, there are few harder decks to beat. If it doesn’t do that it’s a clunky Standard deck with a painful manabase. Bant Company may dominate Standard where card power is more important, but it’s just not good enough for Modern’s more synergistic and fast metagame. My testing showed that the Bant list had this problem, which disqualified it for me. The Spirits on their own weren’t powerful enough to justify the clunky and painful manabase. When the individual cards are powerful enough you don’t really care about The Problem, but if they’re not you should look elsewhere. Bant Eldrazi’s cards are overpowerful enough to get there, which is how it puts up impressive results. Two-mana 2/1’s off Company just aren’t enough. Remand was bad. I lost a number of games with Remand in hand where Unsubstantiate would have been good. I wanted something to buy me a turn against uncounterable spells on several occasions and others where I needed a bounce spell to win the race. Unsubstantiate could do that, so in it went. Phantasmal Image was bad. I had to mulligan a number of hands because my only threats were the two Images. When you pulled off copying Captain it was good, but if you did that it meant you were winning anyway. I had some success copying Wurmcoil, but the Image just underperformed too much so it got cut. I wanted more utility lands. Either Ghost Quarter or Tectonic Edge would have allowed me to power through creatureland-heavy games against Abzan and UW. Sword of Fire and Ice was really average. It was really good when it got going, but I found myself boarding it out. Maybe if I were more creature-dense it would work but in attrition matchups it was a dead draw too often. I wanted another Cryptic Command. I had forgotten how strong it is in race situations in addition to countering spells. Another would shore up creature matchups and combo. I needed Kira, Great Glass-Spinner for the grindy matchups. All the hexproof made me think I didn’t, but experience showed that she was needed. Deciding to cut the Images and Sword was the easy part. Replacing them was hard. There just aren’t that many two-drop spirits. I experimented with Snapcaster Mages for a while, and pairing Tiago with Vial is very strong but my spells were too reactive to be good. I even tried Kami of Ancient Law since I lost to Night of Souls’ Betrayal before I came to my senses. In the end, despite previously being unimpressed with her, I went with Anafenza, Kin-Tree Spirit. It took awhile to notice, but I didn’t need four Unsubstantiate. I wanted the flexibility, but I didn’t need it that often. I cut one for Cryptic. My green aggro matchup was enough worse compared to Merfolk due to the slower clock that I didn’t think Hibernation was worth it so it got cut for Kira. There were only 18 players at the IQ, less than half of what we normally get. I don’t know how this scheduling happened but in addition to the IQ the RPTQ was going on with a PPTQ side event, and a separate PPTQ at another location. The community was badly split, so this ended being more like a typical weekly at Black Gold. I don’t think this makes my results particularly valid, but nonetheless I went 3-1-1 in Swiss and then made the Top 4, where we split the prizes and just played for the invite. This was fortunate for me because I got a frantic phone call from work and had to leave after winning in the semifinals (it turned out to be nothing, but I didn’t find that out until I left and actually looked into the thing). Patrick is playing a deck he calls Demonic Moon, which is a BR burn deck with a lot of Blood Moons. In game one I flood the board with Spirits while he deals a lot of damage to himself from Thoughtseize and shocklands, making me think he’s actually Death’s Shadow . Apparently his hand is full of three-cost cards and he’s stuck on two lands until it’s too late. Thinking he’s Death’s Shadow but unlucky, I board out Geists for Azorius Herald. In game two he gets a pretty good draw of Monastery Swiftspears and Faithless Lootings into an early Gurmag Angler. I don’t see Path and get easily run over. Game three he comes out very slowly but so do I. Eventually we establish our clocks and just race. I win thanks to a timely Spell Queller and the life from Herald. I know Anthony and he is a very good Affinity player who gets the worst luck of any player I know. This trend continued in our match. Game one he just rolls me as my Spirits aren’t enough to make a dent in his offense. Out comes Aether Vial and Geists for the Affinity hate and a Herald. Anthony’s hand is very explosive but requires Cranial Plating to actually to anything. I play a turn two Stony Silence and he can’t muster anything to oppose me once I Cryptic his Whipflare. For game three Anthony’s hand is Signal Pest into Memnite and Ornithopters that is immune to Silence. Unfortunately for him his only land is Darksteel Citadel and I play Kataki, War’s Wage instead. He scoops when I remember the trigger on his upkeep. I’m disappointed because I learned nothing about my deck, just that the Affinity hate is really good. Winning is great, but I prefer to learn something from the games I play. Game one is very interesting because he thinks I’m on UW Control based on my playing lands and saying go. This leads him to attack with a Shambling Vents to make me do something, and he’s not ready when that is Spell Queller and Unsubstantiate. I drop double Drogskol Captain and he scoops. No maindeck sweepers. Out come the Vials and a few Paths and in go Kira and Rest in Peace. Game two is a long grindfest which I might have won if not for Sean hitting Crackling Doom on my Geists. This matchup highlighted the problem of RiP, because while it really hurt him it also turned off my Moorland Haunt which might have pulled me ahead to win. Something to work on. Game three I miss my chance to win by not hitting three lands until turn six. Before that I could have run him out of removal but I never effectively threaten him and lose. I seem to hit Anthony and his DnT deck every IQ. I’m a bit shaken and tilted from the last match, and since he is the third undefeated I agree to draw with him. He also really wants to talk about my deck so we spend the round dissecting my cards. He tells me that he’s been working on UW Spirits too, a version almost identical to mine except he played Eidolon of Rhetoric instead of Geist and Spirit of the Labyrinth instead of Anafenza. He wanted to run it for the IQ, but chickened out. I’m still processing his recommendations, but my experience with the deck does suggest he’s on to something. I win this I’m in, and I’m against the deck to facilitate that. Game One Alex has natural Tron, but doesn’t really do anything while my Spirits bash him. I’ve got two Vials and only an Island for mana, but fortunately his play is World Breaker, not Wurmcoil Engine. He’s too low to stop me from killing him in two swings. Vials come out, Stony goes in. I drop a few Spirits and then play Stony and Ghost Quarter and Alex cannot draw out of his land trouble before he dies. He makes it in to Top 8 at 3-2 off tiebreakers. The Top 8 decklists can be found here—we had a lot of very strong players including all but one of my Swiss opponents. This is a long drawn-out game with Brandon hoping his removal sticks around my hexproof and Selfless Spirit. Eventually I get Captain out and bounce a Timely Reinforcements token to free my Geist to attack and Brandon has no maindeck sweeper to save himself. Moorland Haunt provides a lot of reach for me and ultimately wins the game. Out come Paths and an Anafenza for RiP and Kira. Game two is not actually a game since Brandon has no red source and only two lands and I just crush him. His Blessed Alliance gets hit by Wanderer, and his Snapcaster (trying to block Geist) and Reinforcements get Quelled. I don’t think that says anything about the matchup; any deck should have beaten that draw. The semifinals go almost exactly the same as round 5, but this time Alex finds Oblivion Stone, which I counter with Selfless Spirit game one and then Ghost Quarter him off activation mana in game two. I win handily, but then work intervenes and I have to leave so Alex gets my place. I would have faced Anthony S. again in the finals had I stayed. He beats Alex and wins the invite. I’m left conflicted. My end result (as Star City will eventually post) suggests the deck has a place in the Modern metagame. However, the tournament was so small that I have to doubt the validity of my results. Still, I have some ideas for moving forward and what needs improvement. Anafenza was okay. She helped speed up my clock slightly, but wasn’t much of a threat. She could be cut. Unsubstantiate was very average. It could easily be cut if I find more impressive cards. Moorland Haunt is great game one, but it’s good in the same matchups you want Rest in Peace for game two. Playing Relic is an option, but it’s not as powerful as RiP. I’d like a different utility land in its place. I need to try Spirit of the Labyrinth. Geist of Saint Traft is great against Jeskai but average to bad elsewhere. Its place needs evaluation. The deck either needs another land or another Vial. The deck lives off of three-drops and is mana hungry, but lacks cantrips to fight flooding. It will take more testing to figure out which is right. If nothing else, I suppose the lesson here is that you never know what will be good until you actually try it in paper. Hey David, thanks for the content. Just want to share my opinion with the deck. I played UW Spirits for the last week in over 50 matches in competitive leagues online and I have to say the deck is very good. My win rate is around 60% right now and I will play the deck in Lille to try to surprise some people. There is a lot of testing and punting going on over the last week so that the number isn’t really accurate. General thoughts: The deck itself is a control deck which can play the tempo game at times. We are too slow to race other fast decks and even in the Jund or Control matchups we will take the position of a control player most of the times. We always want to play draw go. Phantasmal Image: It is good. In my opinion you have to play that card, not as a 4of, but as a 2of. It can’t be flashed in with Rattlechains, but it’s still very good when you have Spell Queller out and Vial on 2 or if you have turn 3 Captain + Vial in Image. Against some decks that’s basically a free win. Like I said, a 4of is just bad, because you never want to draw 2 of them early. But as a 2of that rarely happens. Unsubstantiate: The card is not good enough. It has spots where it’s very good, but most of the times it’s a bad Vapor Snag or a bad Remand. Additionally this card is horrible when you have 2 in your hand. Even worse than Image. Geist: It didn’t get played before Spell Queller and the other Spirits were printed and there are some obvious reasons. Modern is a creature format. It’s a good creature on it’s own, but it doesn’t really fit into the strategy of the deck -> all flyers and evasion. Kira: I play her main as a 2of. Flashing in a Kira end of turn + playing a Captain is game over and there are some matchups where Kira is just nuts. I can see myself cutting 1, because it’s bad to have 2 in hand and it’s “just” a 2/2 for 3. But again, that rarely happens and in some matchups she is really good. Additionally I think we need the slots in the SB for other matchups. Anafenza: I haven’t tried this card, because it doesn’t fit the all flyer plan. Of course it’s getting your Spirits bigger at some point, but most of the times it can’t attack. Maybe it’s a good choice, can’t say too much about it, but it doesn’t feel right for me and my plan. Instant chpoices: I think Cryptic is a fine inclusion, but I play only 20 lands and I play Deprive. Cryptic + Deprive is a nonbo. Deprive is not that good on turn two, but I don’t think there is a deck that’s currently better positioned to play that card. With Vial out we just don’t care about taking back 1 land. I played Mana Leak in that slot and it felt just so bad, when you had the power of Deprive before. Sure, there are some situation where the card isn’t that good because it gives you a tempo loss, but the upside is too high in my opinion. I play Think Twice. I never thought this card could be so good in this deck. Keeping mana open is the goal of this deck and if the opponent doesn’t do anything you just get to draw cards and outgrind your opponent. I lost a lot against Jund and Grixis in the beginning. This card tries to fix that problem as well. Furthermore you can’t lose against control with that card. Sideboard: I think Supreme Verdict is a great card against Merfolk/Elves/Affinity and other creature decks. Playing Selfless Spirit into Verdict feels very good. I take out Deprives for that. Additionally I take out Vials for Ancestral Vision (3) for attrition based matchups. Like I mentioned earlier, Jund, Abzan and Grixis are quite hard to beat, therefore we need something to fight that. The rest of the sideboard is pretty straight forward UW stuff, Stony, Rest in Peace etc. If you have any questions about my version of the deck or my choices let me know. I’m happy to talk about it. Awesome input. Our lists sound very similar and you listed many of the issues I’d had and things I’d tried, so I’ve been testing out Think Twice and Deprive in my current list. I’m absolutely loving it, I think it’s the change my list needed. It really lets the deck almost completely operate in draw-go mode, and fixes most of the card advantage issues I was having. I’m probably going to cut the Sea Gate Wreckage’s since Think Twice is working out. They do well when in topdeck mode, but are probably more of a risk than they’re worth (I’d like to have another basic Island). Still not completely sure there. I did see that and I’ve played similar decks in the past. Depending on the metagame it’s either an anti-Jund deck or a really soft control deck, which means it’s well positioned for the Jund heavy metagame. Great to see more people test these UW Tempo decks! I’ve been playing with a variation of Trevor’s UW Flash deck and have wanted more closing power; it seems like an aggressive, Spirit-tribal deck is the next logical step. You said after initial testing you wanted Unsubstantiate to “buy a turn against uncounterable spells”. What spells have you been struggling against? It seems like you have game against a lot of the format’s predominant uncounterable spells (i.e. Rattlechains vs. Abrupt Decay, Selfless Spirit vs. Supreme Verdict). If you’re looking to replace Moorland Haunt and test Spirit of the Labyrinth (I’m guessing Anafenza is the sensible cut), maybe test Mikokoro or Geier Reach Sanitarium? The combo is a bit cute, but Mikokoro in particular could be helpful in grindy matchups to combat LotV or find more action. If that’s too cute there’s plenty of other options depending on what you want the land to do; first instinct, either Eiganjo Castle to improve Geist or a creatureland, probably Mutavault for Drogskol Captain bonuses. Assuming Spirit of the Labyrinth doesn’t pan out, maybe you could fix the “lacking cantrips” problem with… cantrips? Serum Visions could just be too slow for what you want to do, but I have a hard time cutting it from blue decks. I’ve really appreciated having them in the Flash list to scry away late-game Vials. It was mainly Supreme Verdict, though I was also thinking of Boseiju which I saw being played at FNM. I was really more thinking of a flexible spell to replace Remand and that was the first thing that came to mind. I don’t like Mikokoro (I do realize the combo with Spirit, I just expect Spirit to die in response to activation) giving the opponent cards given the matches where I’d want to do that. If I was going to go that route I’d probably go Sea Gate Wreckage and add another Mystic Gate. I have been thinking about Visions. A lot. I’m going to try it at some point, but experience with Merfolk is making it hard to break out of the mold. The Mikokoro combo is neat, the Geier Reach Sanitarium trick is better, but I’m not sure either is needed. 2. Have U tried Essence Flux? Sometimes it is very good to flip your Queller to exile better spell or make your Wanderer bigger to counter a spell (I know, 2 for 1 isn’t the best choice, but sometimes you just have to do it to win the game). I tried 2-of and it was quite good. 3. Have U tried the build with Gift of Immortality? With hexproof guys we don’t need to be afraid 2 for 1 situatuations so much (destroying creature with aura on the stack), and oh boy – Gifts can be devastating for unprepared opponents. On Kami of False Hope it gives us consistent fog effect (bye Zoo, bye Affinity, bye Infect), on Dreamcatcher it gives us consistent card draw, on Safeless Spirit it gives us consistent indestructable on creatures and on Wanderer – consistent counterspell. It is useless sometimes, but in my experience – not so often as I thought it would be. I’m using it now in heavy creature built, and for now – it is quite promising. Although popularity of Dredge is forcing people to pack up graveyard hate, and Gifts suffer from it quite strong. 1. Kami is good when Infect goes all in and pretty mediocre otherwise. You have to win in the time that it buys and that can be very difficult for Spirits to do that. 2. It’s in my Standard Spirits list. It’s a two of there, and I don’t think it’s good enough for Modern. If I wanted the effect I think I’d find a way to play Eldrazi Dispacer. 3. The three drop slot is crowded enough that I don’t think it’s advantageous. 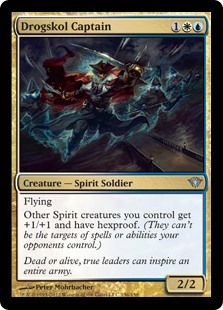 http://tappedout.net/mtg-decks/24-08-16-REb-spirits/ Check this spirit deck! with mutavault and cavern! 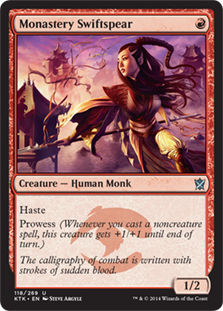 I really like the list, was a little surprised to see that you went all the way up to cryptic command but i like it. You can do some pretty sweet with with a deck like this, with cryptic. Currently I’m trying out a similar list but im splashing blue for lingering souls x 3 and shadow of doubt x 2. also im in favor of dropping the anafenza as well. I actually have both Kira x 2 and spellskite x 2 because of the synergies with sqell queller and drogskul captain. Overall I’ve liked them better than running images or anafenza, having some skites main just wins some matches, then being able to protect it makes it even more gross. and also if you have kira plus skite out, against things like conflagrate/ ad nauseum you can redirect and counter what would of killed you. Been debating dropping the shadows, but having them against some matches are just great, might try squelch in it’s place, but having the anti search against tron seems great…….although now that i think of it squelch hitting an ugin activation is probably gg.